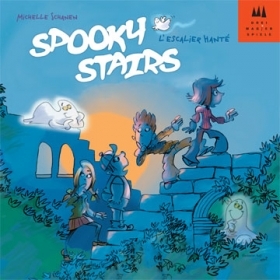 On the "Spirit Stairs" it gets quite spooky. There's a race in the old castle ruin, and the most courageous have the edge. The ghost lives at the top of the stairs. Being completely quiet, a few brave children dart up the stairs- everyone wants to be first to scare the ghost with a "BOOOO!" But the ghost knows this age-old game and has secretly enchanted the die. The players themselves are transformed into ghosts - one after the other one! If a player rolls a "ghost", he may place a ghost piece over another player's pawn. A magic magnetic field connects the two and the pawn disappears! Now the players must remember for the remainder of the game under which ghost their own figure is. If all players are transformed and another "ghost" rolled, two ghosts may be exchanged. Whoever can make it to the top of the stairs in this chaos wins. 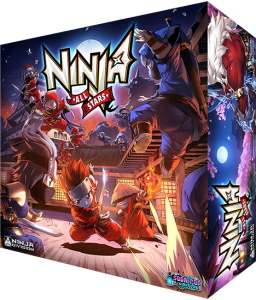 Assemble your clans mightiest ninja and compete for honor and glory in the annual ninja games. The moonlight casts a pale light over the battleground as you compete with your team, earn experience, gain skills, and battle rival ninja clans in this league/campaign style game. 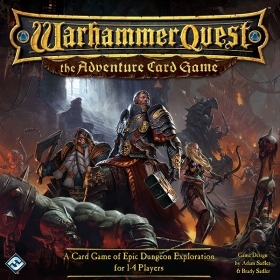 Featuring world class Chibi style sculpts from the world famous Soda Pop Miniatures team (makers of Super Dungeon Explore), expect fun and whimsical game play to be married with fantastic and unique style and fun. 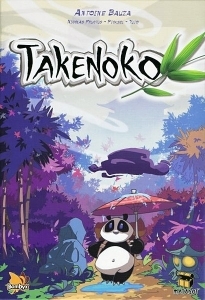 In Takenoko, the players will cultivate land plots, irrigate them, and grow one of the three species of bamboo (Green, Yellow and Pink) with the help of the Imperial gardener to maintain this bamboo garden. They will have to bear with the immoderate hunger of this sacred animal for the juicy and tender bamboo. The player who manages his land plots best, growing the most bamboo while feeding the delicate appetite of the panda, will win the game.